Not quite as stunningly tempting as the ASOS deal that they offered a couple of months ago (how many of those did you buy? ), the latest offerings from Groupon are still pretty damn impressive! A year-long subscription to either: Vogue, Glamour, House and Garden, Tatler, GQ, Wired, The World of Interiors, Condé Nast Traveller, Easy Living or Vanity Fair for a one-off payment of £19.99. 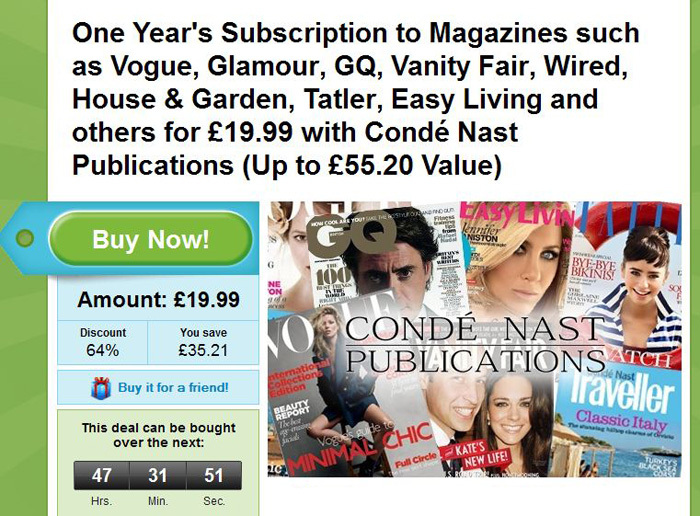 This deal has the potential to save upto £35.21 depending on which subscription you take out. I’ve bought one to subscribe to Vanity Fair ‘cos I like the front covers innit. If you want to take advantage of the Groupon Magazine Subscription deal, you have until midnight on Friday. This works in the same way as the ASOS deal in that, you spend a certain amount to get far more back! Part with £8 of cash to receive a voucher that will entitle the holder to purchase £20 worth of products on the Eyeko website. My top picks would be the nail polishes… simples! 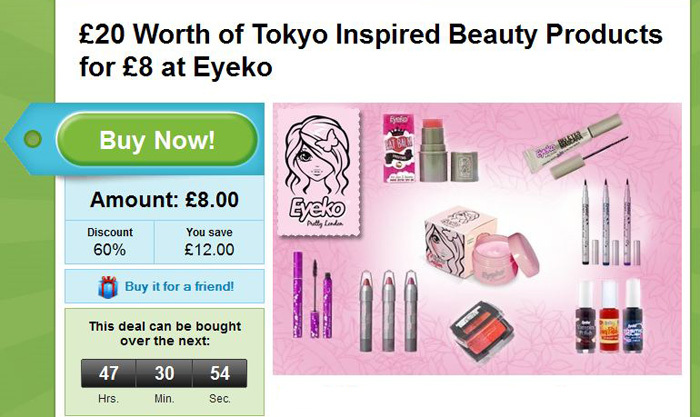 If you want to take advantage of the Groupon Eyeko deal… again, you have until midnight on Friday. Happy shopping! Have you spotted any other great deals lately? I love Groupon deals, the site both baffles and amazes me. The magazine one is good if you go for Vogue or Vanity Fair but you can get a year sub to Glamour for £1 an issue through the magazine.